For anyone wanting to help fire victims this summer of the Carr and Mendocino Complex fires, here’s the chance. A special concert event is being planned in Tahoe City and event proceeds will be donated to a nonprofit organization assisting those impacted by the Carr and Mendocino Complex fires. The concert takes place Sunday, Sept. 9, from 3 p.m. to 6 p.m. at Commons Beach in Tahoe City. Local residents and visitors are invited to attend the free concert. Public Eye will be the primary band performing at the benefit concert Sept. 9 in Lake Tahoe. 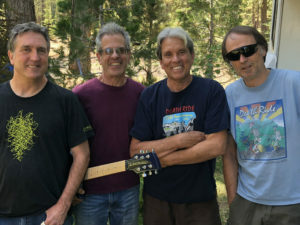 Similar to the popular summer Concerts at Commons Beach, the afternoon will feature music by one of Tahoe’s original “house bands,” Public Eye. Special guests will include Ben Martin from the Tahoe Truckee School of Music, Michael Loomis and Brian (T.S.) Silverman. Lindsay Romack will serve as the event’s emcee. Beer and wine will be available for purchase. Contributions collected that day, as well as a portion of beer and wine sales, will be donated to fire victims. The show is being co-produced by local residents Robbie “Renegade” Polomsky and Judy Friedman, with support from the Tahoe City Public Utility District, Tahoe City Downtown Association, The Bridgetender, Tahoe Dave’s, Blue Agave, Lagunitas Brewing Company and Barefoot Wine and Bubbly. In addition, all of the musicians and sound technicians will donate their time and talents. “The smoke we’ve experienced in the Tahoe-Truckee region this summer as a result of the fires burning across the state has been a constant reminder of the incredible losses people have experienced. There’s a strong feeling in our community that we can and should do something to help. This is that something,” Friedman said. Learn more or become an event sponsor by contacting Judy Friedman at The Paper Trail. Email Friedman at jfriedman85@hotmail.com or call 530 581-5692.